All moms have self-doubt. I think it is built into our DNA. If you scroll through your social media feed it is pretty easy to start feeling like you aren’t doing enough. You see the other moms have it all together. I am exposing myself in the opposite way. I know I am a good mom, but even the best of moms have their flaws… Here are 10 of mine. 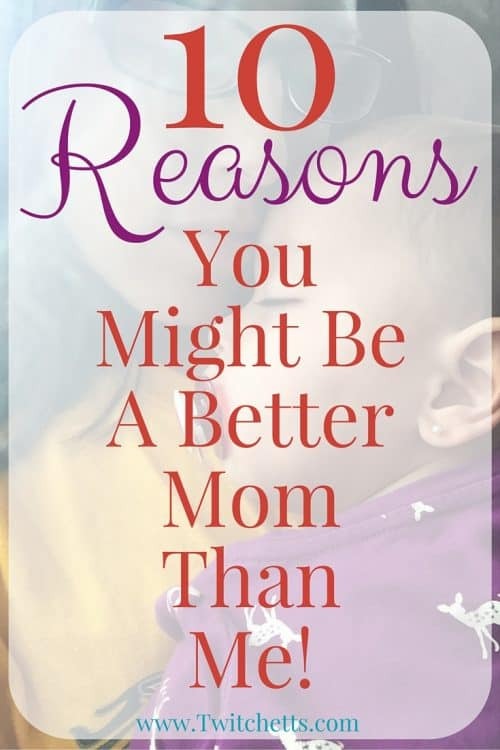 These might make you realize you are a better mom than you think. 1. I never finished my son’s baby book. I think I made it to the 6-month mark… He is now 8. I didn’t even start one for my daughter. I have one… With the thousands of pictures of our kiddos these days, who needs a baby book right?! 2. I haven’t found the perfect IG filter to make my life look perfect. I have spent more time on Instagram lately and I am noticing something huge… I’m obviously not using it right! I see all of these perfect pictures and perfect threads. They use the same perfect filter to make their entire feed of pictures look… Perfect. 3. I let my daughter watch 5 hours of T.V. yesterday. This has happened on more than one occasion. Between a morning show (or 2 or 3), a nap time show (a.k.a. give me some space to make lunch), a let’s relax show (since you Refuse to nap anymore), you get the picture. It is easy for that time to add up. Especially if you work from home and have things you need to get done that day. I still credit Jake for teaching my daughter to count to 12! 4. I have been unsuccessful at potty training… Not once, or twice, but three times! We started with a chart, Success!! NOT. It was a solid 2-week effort. Then we went with a potty that makes noise. That worked for a week. Then we went with the rewards for staying dry. This was working… Until mom threw out her back and was laid up for a week. We will be starting attempt number four soon. 5. My daughter and I snack our way through the day more often than not. We usually start with breakfast, there is sometimes a resemblance of lunch, but dinner is the only real meal that she sits down at the table to eat every single day… Grabbing apples, baby carrots, and cheese through the day is a regular thing around here. 6. I don’t remember my daughter’s first word. 7. I have bragged about my children’s good sleeping habits. I try not to do this a lot, in the world of moms, this is a big no-no. But, come on! My kiddos always were and still are good sleepers. They go to bed with ease and rarely wake overnight. I am proud of that… Not sure if it was anything I did or didn’t do. But, we all have things our kids are good at. I hear of little girls being potty trained before their 2nd birthday…. We all have our little victories as parents. We need to embrace them! 8. My kids didn’t make it to Santa last year. Now I’m not a big anti-Santa mom. I’m also not a huge pro-Santa mom. We just had our plans fall through over and over, and I will admit, it wasn’t high on my priority list. I am pretty sure I didn’t scar my kids. 9. I have used my children’s behavior to justify a glass of wine for the 4th day in a row. I like my wine what can I say… As a stay-at-home mom, it seems like people just expect you to need a glass after spending the day with a 2-year-old and most days I will take it! 10. My house is always a mess. I will go into crazy mode and clean for a party or for before company, but it only lasts that day. In general, if you come over unannounced you are bound to run into a pile of toys, a stack of clothes (if you’re lucky they might be folded), a few dishes in the sink, and an activity on my kitchen table. Are you feeling like super mommy yet? Because the truth is if you ask anyone who knows me or my children they would tell you that I am an amazing mom. I love my kids, they are smart, they are well behaved, and they love me too. Our day to day life isn’t perfect; I don’t want it to be. It is our life and we are loving every minute of it!